All of our birdwatching tours can be personalized to meet your individual needs. Choose from one of the programs below, or make your own itinerary. If you need assistance putting together your ideas, let me know... Down East Nature Tours is available all year for snowshoeing, skiing, hiking, or biking adventures. Call ahead to assure your dates. * Beginners and advanced birding trips daily. * Diverse habitats such as forest, marsh, upland, coastal and more. * Sunset and sunrise trips. This 4 hour session is for beginning birdwatchers who want to gain a better appreciation for the native east coast species. We show you how to positively identify species by listening to their calls and observing their habits. Species often encountered include: Bald Eagles, Osprey, Peregrine Falcons, Great Blue Heron, Pileated Woodpeckers, Wood Warblers and Shore Birds. For the advanced ornithologist searching for a life bird list or individuals seeking to observe unique species, we offer trips that take us into the heart of Mt. Desert Island and Down East Maine, looking for elusive prey. Please call in advance. Join us for a truly unique tour through the Three Pines Bird Sanctuary on the outskirts of Bar Harbor. We will explore the lives of birds, mammals, amphibians, and plants of a Down East wetland. Excellent for families. Join us for a day or a week to ten days as we explore the heart of Maine's Down East region. 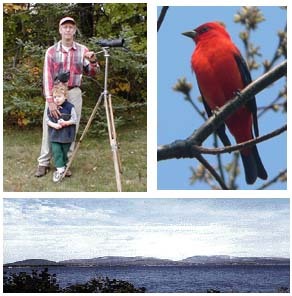 From Camden to Eastport you will learn about its cultural history, birds and wildlife from Ornithologist and Naturalist Michael Good. Puffins, Razorbills, Thrushes and Wood Warblers. We travel by van to the beautiful Gouldsboro Hills at the northern end of Frenchman Bay. Here we have the possibility of finding Boreal Chickadees, a specialty bird for the region and a variety of Wood Warblers and other forest species . Lunch can be included if requested. We will Hike Schoodic Mountain or some of the other incredible trails around this beautiful state park with possibilities for stopping along the way at some local birdwatching hot spots. Arrive at (Boston/Portland)/Bangor International Airport for a (2or3) PM departure for Machias. This is a three hour drive with little opportunity to bird along the way. Next two/three night in Machias at the Blueberry Motel. Bird the Machias/Lubec/Eastport region. Bird around the Machias area. Local hotspots. Night in Machias. We depart from Jonesport for a half-day trip to Machias Seal Island for Atlantic Puffins, Common Murre, Black Guillemot and Arctic tern. Night in Machias. Early Morning departure for a long and birdy drive through the Northern Forest from Grand Lake Stream to Bar Harbor. This is an excellent ride with many stops and many good birding possibilities. Boreal Chickadees, Gray Jay, Goshawk, Alder, Olive-sided, Yellow-bellied Flycatchers are possibilities. Next three nights in Bar Harbor at the Eden Brook Motel. 9AM departure on Whale Watch trip for Gannets, Shearwaters (Manx, Sooty, Greater), Storm Petrels and Fin-backed, Humpback or Minke whales. This trip can produce some excellent results. Afternoon birding to local hotspots. Clothing: Be prepared for cool mornings and warm afternoons. Rain gear and warm clothing is necessary for pelagic trips. (Dress for winter). Light hiking boots already broken in are recommended. Minimal luggage, please. Equipment: Binoculars, field guides, spotting scope. Food: Bring money for meals. Stops will be made en route to purchase supplies for sack lunches and occasional supplies for sack breakfast. Others: Alarm clock, sun screen, Dramamine or Bonine for seasickness, insect repellent, canteen, chapstick, flashlight.